Apple Muffins make healthy snacks for any time of the day! If you are looking for easy recipe ideas to make delicious muffins with apples, you have come to the right place! Of all the available types of muffins, one of my absolute favourites is apple. In addition to their delectable flavour, muffins with apples are nutritious as well! 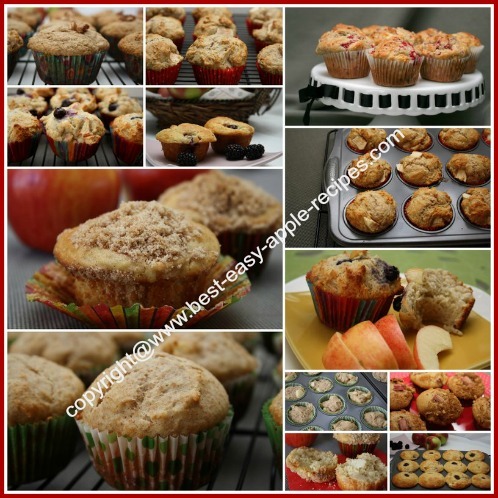 I love making these muffins when the local apples are ripe and plentiful. Delicious muffins bursting with apple pieces are perfect for a grab-and-go breakfast, for a healthy addition to a bag lunch, with a coffee of tea for an afternoon snack, or simply for an energy boost during your busy day! These muffin recipes are designed for maximum taste and pleasure with only minimum effort! Homemade muffins taste much better, are usually much better in quality, and are less expensive to make than purchasing store-made muffins. Never use electric beaters when mixing muffin batter. Batter should look lumpy when finished. Always pre-heat the oven when baking muffins. Baking the muffins as soon as they are prepared makes the batter able to "puff up", because the baking soda and powder begin to work as soon as the wet and dry ingredients are combined. The muffins may not rise as well if the muffin batter has been sitting for a long period prior to baking.